Some crucial-sounding words in there: "Alias." "Real names." "Profile pictures." "Anonymity." But what exactly does all that mean? Like so many other things introduced at the PS4 event, it's not entirely clear. Since its inception, the PlayStation Network has for the most part been a gateway to buying content and a loose way to connect with your friends to play games. But Sony appears set to turn their service into much more of a "proper" social network. And parts of that social network are going to involve your real name. Let's scrounge for crumbs of information and see if we can't get a sense of what Cerny is saying, as well as what he's purposefully leaving unsaid. 1. "We are transitioning to a friends network based on real world friends." Vague language, but he's really just talking about emulating Facebook. When Sony launched PSN, Facebook wasn't nearly the juggernaut it is today, and it stands to reason that Sony (and likely Microsoft) will be taking cues from Facebook when designing their consoles' new social environments. From the look we got at the PSN's new social profile page, it appears as though your friends list will made up of "real" people, by which Cerny just means that you'll actually see the name behind the alias. I actually like that, as a broad idea—I've found that on both PSN and Xbox Live, I've lost track of who a lot of my "friends" are. Often on my Xbox, I'll see pop-up notifications that "Player X has come online," but it'll feel like I've never even seen that gamertag before. Have I simply forgotten? Or did the person change their tag? It's difficult to tell who they are. It'd be nice to simply see peoples' names. I've found that on both PSN and Xbox Live, I've lost track of who a lot of my "friends" are. 2. "We'll keep around the alias and icon used in today's multiplayer matches. These are great to have when anonymity is important." This bit is the escape hatch Sony has left, should the whole real names idea fall flat. An assurance that feels designed, more or less, to circumvent the sort of user-outrage that rained down on World of Warcraft- and StarCraft-makers Blizzard when they announced their Real ID program back in 2010. Blizzard's thinking was that by forcing users to post in the Blizzard forums under their real names, it would cut down on jerks and trolls. But the community quickly pointed out a lot of unforeseen downsides that Real ID would have, in particular that it would make women much more visible than they had been and therefore even easier targets for creeping and forum stalking. Following an overwhelmingly negative reaction from almost every corner of their fanbase, Blizzard scrapped the Real ID system. Surely Sony was paying attention to that debacle, and will offer some sort of alias-based, anonymous online existence for those who want it. The question that remains is: How will that work, and will there be aspects of the PS4 that can only be used under your real name? 3. "Most of the new social dimension to PS4 will be interacting with friends using real names and profile pictures most likely seeded from your existing social network." When Cerny says, "Your existing social network," he probably means "Facebook." That dovetails with later remarks from Gaikai president David Perry, who said outright that the new PSN will be integrated with social networks, including Facebook and Ustream. And, like Facebook, it sounds like they're going to connect all of that to your real name and profile picture. Maybe you'll also be able to import your Facebook friends list into your PS4, or go through some PSN app to invite your friends to play with you via Facebook. Or other such cross-platform stuff. When he plays Call of Duty multiplayer, it's likely that Henry can set things so that his foes only see DayZ100 headshotting them. The image of Henry Bayle's profile page lines up with that. Note how this (handsome!) Bayle chap has got an icon and an alias underneath his real name. When he plays Call of Duty multiplayer, it's likely that Henry can set things so that his foes only see DayZ100 headshotting them. (Also: Nice DayZ reference, Sony. Very "now.") It seems probable that he will be able to set his profile so that no one can see his real name unless he wants them to, so even if someone wanted to track him down after a match, they couldn't. But beneath that, note that it says "Henry Bayle shared a video from KNACK." It does not say "DayZ100 shared a video from KNACK." That makes me think that the extra-game social functions of the new PSN will require you to do things under your actual name, and not under a pseudonym. All of the slick video sharing, streaming, spectating and game-visiting that Perry described will likely be tied to that social network, and therefore users' actual names. What exactly will the PS4's privacy settings entail? Which actions will be tied to your real name, and which will be anonymous? Will it be possible to set up a PSN account under a made-up name with a fake profile, and continue to operate in complete anonymity? Those questions all remain unanswered, and will likely be shrouded for a good while longer. I'm curious to know what you think. So I made a poll. How do you feel about using your real name on the PS4? 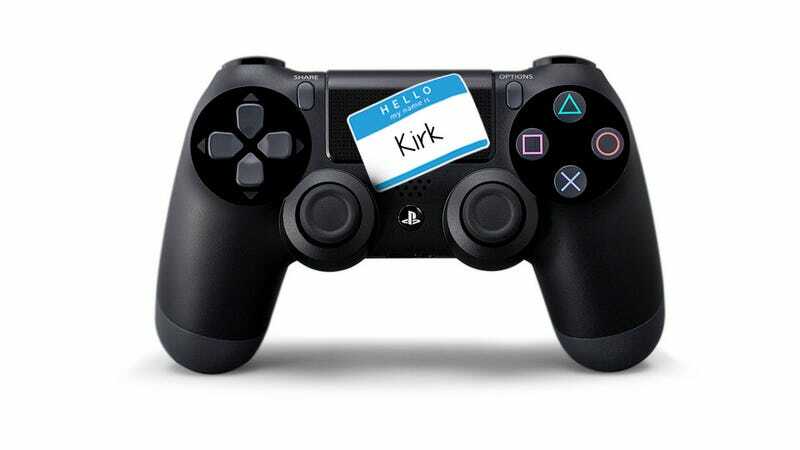 Would you welcome a shift to a real-name social network, or are you happy with how the PSN works now? If you played multiplayer games under your actual name, would it impact how you act towards others? What would Sony's social network need to offer for you to carve out a space for it in your digital life?